Producing an expansive 180° angle of view, the Nikon F-mount 15mm f/2.8 EX DG Diagonal Fisheye Lens from Sigma offers a super-wide perspective for creative applications. As a diagonal fisheye, this lens produces a notably distorted image that fills the entire frame, and its minimum focusing distance of 5.9" allows for working with unique perspectives with close-up subjects. Additionally, the bright f/2.8 maximum aperture benefits working in difficult and low-light conditions by allowing the use of faster shutter speeds. Diagonal fisheye lens is designed for FX-format Nikon F-mount cameras, however can also be used with DX models where it provides a 22.5mm equivalent focal length. Box Dimensions (LxWxH) 5.3 x 4.2 x 4.0"
15mm f/2.8 EX DG Diagonal Fisheye Lens for Nikon F is rated 4.7 out of 5 by 70. Rated 5 out of 5 by Anonymous from A very well designed lens I am using this fisheye lens with my Nikon D800 and 35mm SLR. This Sigma 15mm f/2.8 Fisheye lens is very similar to Nikkor 16mm f/2.8 Fisheye lens. 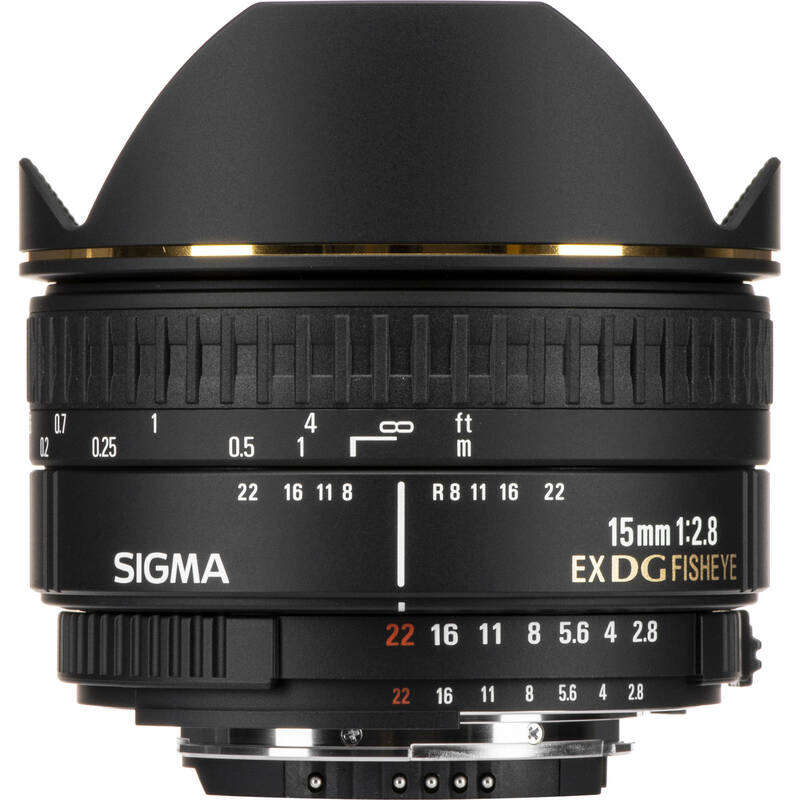 Personally, I am not a big fan of Sigma lens. But I think this Sigma fisheye lens is as good as Nikon's if not better than. This lens is as sharp as Nikon's fisheye with a closer focus distance but less expensive than Nikon's 16mm fisheye. I especially like the front cap of this lens. It is far better designed than Nikon's fisheye lens. It is well attached to the front of the lens and very easy to take off. I would strongly recommend this lens. Rated 5 out of 5 by toolfool from deserves 6 stars I am using this lens with a Nikon d200. I originally purchased it for use on my F-100 (Nikon film camera). Although you do lose the super-wide effect on a DX format camera, this lens will not dissapoint. It is razor-sharp! It is a fantastic lens for producing artistic images.I would not recommend it for arcitectual applications, but if you want a fast (f/2.8), sharp and fun lens to work with, I would highly recommend this lens to any one. What ya waiting for? Go get one! Rated 5 out of 5 by Robert from Terrific Quality This lens delivers quality images, and is extremely well built. I use it on a D 810. The lens cap is metal, not plastic, and fits perfectly over the built-in metal lens shade. The included lens case is made of ballistic nylon with inner foam padding (not just a soft storage bag) and is functional with a belt loop. High quality, lighter, and 1/3 less cost than the manufacturer's lens. I use it for spherical panorama images, and find the entrance pupil is right at the gold stripe. Know that the field of view is 180 degrees only on the diagonal (as is the Nikon 60mm) so you will need 6 images for a 360 degree equirectangular stitched image. But, using 3 rows (+60 degrees, 0, -60 degrees) stitches perfectly to give an equirectangular projection with zenith and nadir coverage. Rated 5 out of 5 by Ezra from Really, a fantastic lens The lens is really an overlooked gem. It is very! sharp,focuses very! close and is quite wide even on a DX formatcamera (120 degrees) You have to be able to appreciate, andwork with the barrel distortion, although, on DX it is muchless crazy fisheye than on a full frame camera. Still it issomething to work with - the barrel is very noticeable inarchitecture, but for street shots, people shots, creativelandscapes, this lens, for me, is awesome. I like thedifferent look that the barrel distortion gives, plus youcan control for it using composition and also PTlens does agreat job of straightening the lines out in photoshop if youso desire. Really, a nice piece of glass. As someone wholeft a 24mm lens on his film camera 90% of the time, this22mm or so equivalent, with its wide and different view iseasily one of my favorite fields of view. Expertise: At times semi-pro, always enthusiastic practitioner, over 25 years Problems Encountered: None - there is even a way to add a protective filter - geta filter extender (blank ring with threads on both sides67mm - add a single wrap of electrical tape) and then screwin a 67mm filter. The assembly is snugly held by the petalhood and the filter is held safely away from that bigbulbous front element. Rated 5 out of 5 by Bob Zielinski from Great lens and a great value The Sigma 15mm 2.8 is really a very fine lens. The build is first rate and the glass is in the upper tier of the lot. I'm very happy to have this lens as part of my arsenal of glass (mostly Nikon 2.8 and other Sigma primes). I think it's great for landscape views and (clearly) for special effects. Are there differences between Sigma and Nikon resolution, coating and clarity? Yes, (or so I've read) but with this lens in particular, I can't really see it. The only not so great part of this otherwise great lens is that it functionally cannot accept in front of the lens filters. There is a slot for gel filters on the rear lens housing but rather than screw with sharpness, I'll just use the lens more judiciously. Rated 5 out of 5 by j.buck from Fantastic Lens This is the first lens that I have bought that was not from the Nikon brand. I was a little skeptical but the quality is just fine. Great quality, fast focus. Rated 5 out of 5 by James Gaston from A great FX fisheye I love shooting wide and for years I've loved the Nikon 10.5 fisheye on DX. So when I moved to FX I needed a new fisheye. The 10.5 works on FX but doesn't utilize the whole sensor. This Sigma is wonderful and gives me all the performance of the 10.5 in terms of sharpness, close focus, and color. I have found it needs a little (-0.7) exposure compensation on my d800e. I highly recommended this lens. Rated 5 out of 5 by Anonymous from Loving the lens In the past I have always used a 16mm Nikkor. Which I loved. I was a bit hesitant to purchase the Sig 15mm, but went for it. So far, it's great. Nice and sharp, not getting a lot of flare (I shoot in the sun a lot since I do a lot of automobiles and motorcycles), the barrellig is an effect that I wanted (so no issue there), nice depth of field and you cannot complain about the price tag coming in at about $300 under the Nikon. For me, this was a great choice and I am pleased that I did not spend the extra cash on the Nikkor. I have recently broken into doing more cars, motorcycles, car show events, etc... vs. senior pics, families, portaits and weddings - so this has become a primary lens for me. This will work with the Sony A7 without vignetting. You would need the following adapter: B&amp;H # MENFEBM2 . I would suggest the Sigma 15mm fisheye as it is very sharp, is close focusing and will fit on a full frame sensor camera should you buy one in the future. Will the Auto focus work with a D5200? The AF motor in this Sigma lens requires the camera to have its own AF motor to drive the lens (such as the Nikon D90/D7000 series cameras and above). The D5200 does not have the built-in motor, so it would not drive the motor in the Sigma 15mm lens. 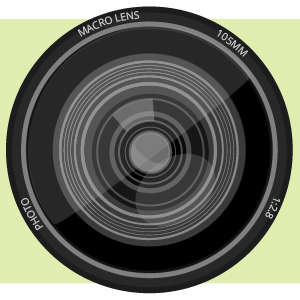 I am looking for a great fisheye lens for a Nikon D3000, what would you suggest? The Specs say that this lens has filter threads on the rear, but they don't say what diameter those threads are. Does anyone know? i HAVE A D750 , SINC THE CANMERA HAVE A INTERNAL FOCUS SYSTEM, WILL IT WORK LIKE A AUTO FOCUS SYSTEM OR I HAVE TO DO IT MANUALY? Yes, The Camera's built in AF Drive motor will automatically focus the lens. However, it can also be used in Manual mode as well. I have a Nikon D7100, what kind sigma len would you recommend for taking in door photo for real estate listing? Will this lens work on Nikon D810 FX camera? It should work fine. I use it with a D700 full frame camera and it works very well.